I am trying with them on and off. When they first started they had some issues but they have improved very much. The support is not so good I trade with them for their honesty and spreads . Had minor withdraw issues. . My thoughts are they don’t have the best offers with meta trader. After I read their site, I decided to open premium account with them and deposit $400. executions quality is always the same, and withdrawal always smooth. 8 months after my last review about FirewoodFX. And till now i still trade with them. Still satisfied with their services, and now i am tried to maximize my earning potential with them , and applied as FirewoodFX IB, Pamm Trader, and signal provider. 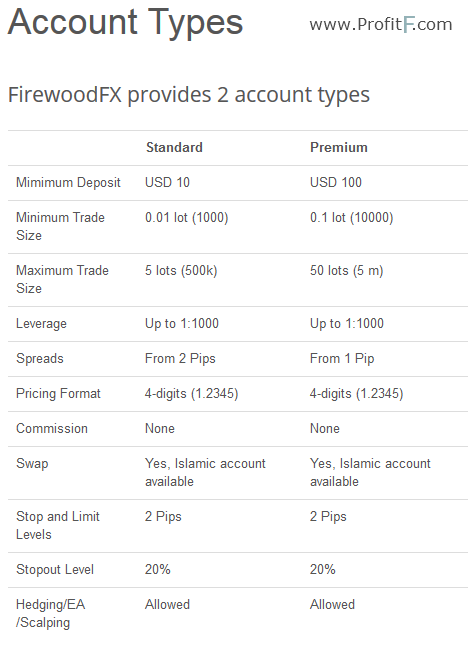 With FireWoodFX, you can trade as you wish – long term, short term, intraday. You can make money and to use comfortable trading conditions. This is the most important part for every client and trader. You can use MetaTrader 4 for trading, as it is perfect for mobile trading also. So you can trade wherever you are at anytime with PC, iPhone, iPad, iPod, and Android devices. They try to give the most comfortable conditions for each their client. The minimum deposit amount is 10 USD, as you can invest money with payments options such as Neteller, Perfect Money, Wire transfer, Debit/credit card and other. You can receive also 20% welcome bonus, you need only to make $100 deposit or more and just get 20% bonus. You can also receive trading reward bonus up to $5000. You must read their bonus terms for more information. The trading could be more profitable, if you know what risk to choose, so the deposit amount is one of this part.